Understanding your Property boundaries is an integral part of home ownership. A Real Property Report will identify these boundaries. In the case of a missing or old RPR, a property line survey can also be used to locate the boundaries of the property in question. Thinking of building a fence or replacing your old one? Fencing is considered an important residential design element. A properly built fence will add value to your home, create privacy, keep out any unwanted pets and give you a physical reference of your property boundaries. If you’re looking to maximize the use of your property, it is essential to know where the boundaries of your property are located, before constructing a fence. 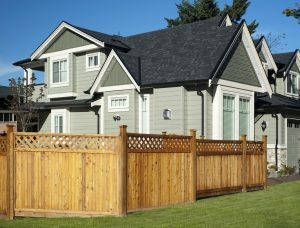 Most municipalities or local community associations will have bylaws in place to protect property values from fence construction that could damage the character of a neighbourhood. Be sure to check with your local municipality for further reference. Fences or retaining walls are built into city/municipal property. This is a common occurrence and is a result of not understanding the whereabouts of your property boundaries. Fence height restrictions are not met. Corner lots typically have height restrictions to ensure safe sightlines for vehicle and pedestrian traffic. Unless built directly on the property line, fences or retaining walls that are in a utility right-of-way could potentially be an issue with the municipality. If you wish to be the sole owner of the fence, ensure that it is located entirely on your side of the property boundary. If there is any doubt about the fence location, insist that the property line be surveyed and marked out. This will eliminate any uncertainty and will save you the expense and hassle required to move the fence due to encroachments onto municipal or adjacent neighbouring properties. For the added level of assurance and peace of mind, please contact Arc Surveys before you build a fence to have a licensed Surveyor determine your property boundaries. Portions of this information was supplied, with permission, courtesy of the Alberta Land Surveyors’ Association.